McDonald’s employees across the country have begun stuffing the latest series of small Mario-themed pieces of plastic into smiling cardboard grease boxes. 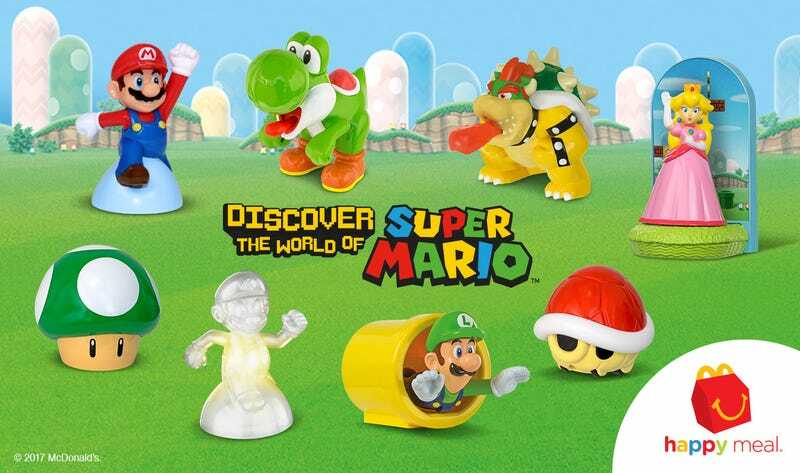 New Super Mario Happy Meal toys don’t mean you have to eat the food they come with. There are other ways. Have children: No matter how good your intentions are towards your children’s good nutrition, they’re going to figure out Chicken McNuggets eventually. Don’t worry, a Happy Meal now and then, say once a week when the toys rotate, won’t kill them. For extra bonus points, have twins. I’ve already thrown away two Yoshi’s and a Mario this week. Get a job at McDonald’s: Maybe not this. How about instead . . .
Make friends with someone who works at McDonald’s: Look at this promotional video for jobs at McDonald’s. These are fun people! Friendly people! People who look like they’d be willing to make sure you get a full set of Super Mario Happy Meal toys. I’m not saying you should take advantage. What I am suggesting is you form a lasting relationship with them, support them when they need you, have them do the same. Maybe one day make one of them the godparent of your child. By then they’ll know you well enough and care deeply enough that they’ll just set aside the toys without asking. Just be quick about it. Turnaround is pretty high, and you don’t want to waste your life pursuing the McDonald’s friend dream. Give the Happy Meal to someone who really needs it: Nothing turns around the life of a person down on their luck like a Happy Meal. That four dollar box of salt and grease and maybe some apples can not only feed someone, it can make them question their life choices to the point of possibly affecting positive change. Will they laugh as you go through the drive thru? Yes. Will they laugh after you leave? Of course they will. But you will have your toys, and they will have a story to tell their friend from a few tips back.